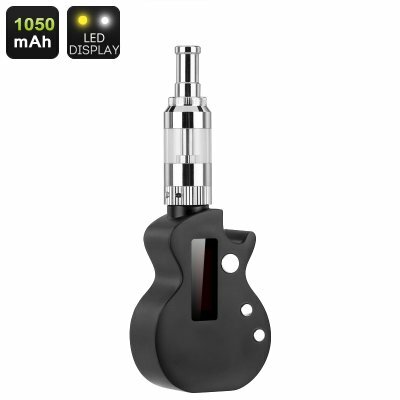 Successfully Added Guitar-Shaped Electronic Cigarette - 1.0-2.0 Ohm Resistance, 1050mAh Battery, Temperature Control, 10Watt, LED Display (Black) to your Shopping Cart. This extraordinary guitar-shaped electronic cigarette is the perfect vape mod for all artistic and music loving people out there. Thanks to its beautiful design, this e-cig functions perfectly as a gift as it is guaranteed to meet the likings of all music enthusiasts. Unlike the regular bulky vapors, this e-cigarette features an extremely compact and lightweight design, making it extremely portable. Simply slip this stylish electronic cigarette into your pocket or purse and you’ll be able to carry it along wherever you go. Whether you simply like to enjoy a relaxing vape in the park or want to steal the show during the upcoming festival season by displaying your guitar-shaped vapor – this beautiful device is sure to meet your needs at any occasion. With its sophisticated temperature control feature, this artistic E-cig gives you the possibility to manually set and adjust its settings to meet your exact personal vaping needs and likes. Along with its 2-ohms resistance, this little vapor mod kit can handle large amounts of Wattage – allowing you to enjoy all its taste to the absolute most while producing exceptionally large vapor clouds. From now on you’ll be able to steal the show and impress all bystanders with your skills as the vaping clouds produced by this little beauty truly are magnificent. Packing a large yet lightweight 1050mAh battery, this compact electronic cigarette lets you vape throughout the day without you needing to worry about running out of juice. Thanks to its easy to operate design, this E-cigarette can be used straight out of the box – making it the perfect vape mod kit for both advanced and beginning vape lovers out there. Simply pour in your favorite vape liquid into the cigarette’s tank and you’ll be able to enjoy hours’ worth of tasty and relaxing vaping sessions in a style full manner. Not only will this e-cigarette allow you to enjoy your vaping experience to the absolute most, it also ensures that you’ll look cool and are ready to steal the show while attending those upcoming music festivals of friend gatherings. Intergraded within its guitar-shaped design this stylish e-cigarette holds a small yet bright LED display that constantly informs you about the current status of your e-cig. On this sophisticated display, you’ll be able to keep track of your current battery level, temperature level, current Wattage used, and a whole lot more. With all this information at hand, you can be guaranteed that you’ll always have the right settings enabled to take the absolute most out of your upcoming vaping sessions and never unexpectedly run out of power again while enjoying your vapors to the absolute most. This Guitar-Shaped Electronic Cigarette comes with a 12 months warranty, brought to you by the leader in electronic devices as well as wholesale electronic gadgets..